With the master bathroom finally complete, I thought I’d update y’all on the master bedroom. This is what the room looked like on move in day. The before was way too dark and dreary for my taste. I wanted a master where the light would flood in and the colors were muted and serene. 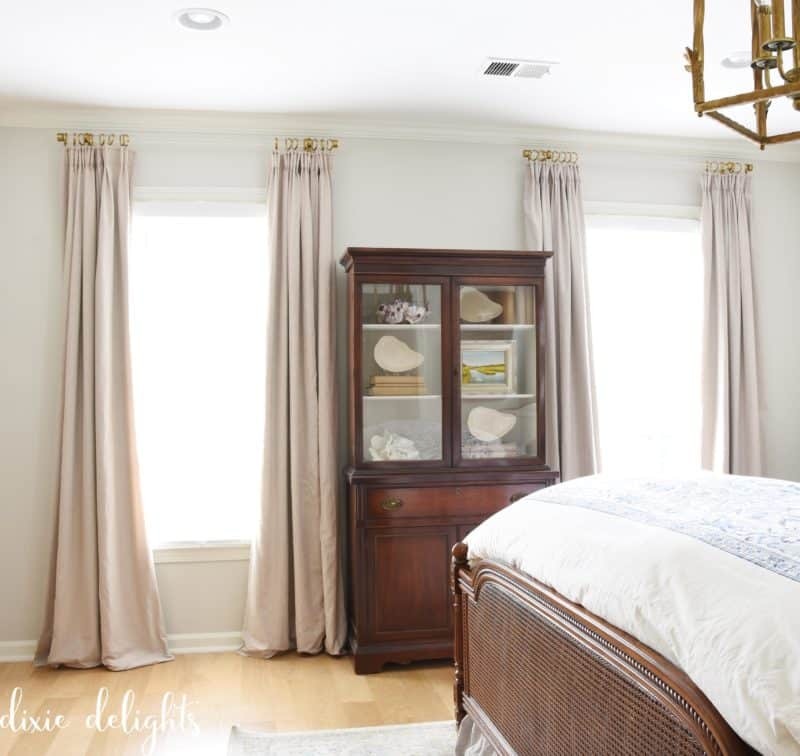 Through the last decade, we painted the walls and trim, removed the ceiling fan of helicopter-ic proportions, and put in hardwood floors to match the rest of the house. 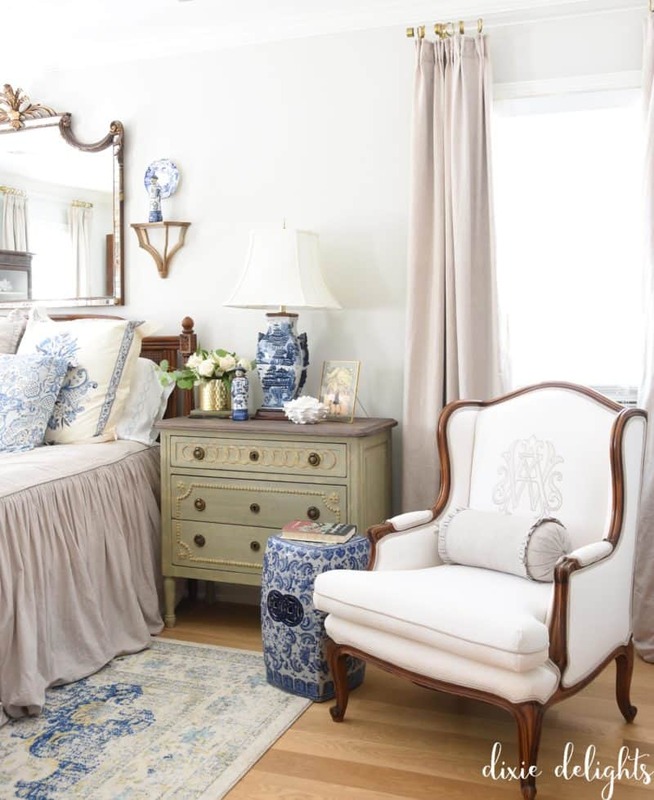 All of the bedding stayed the same, with accessories and furnishings changing over the years. 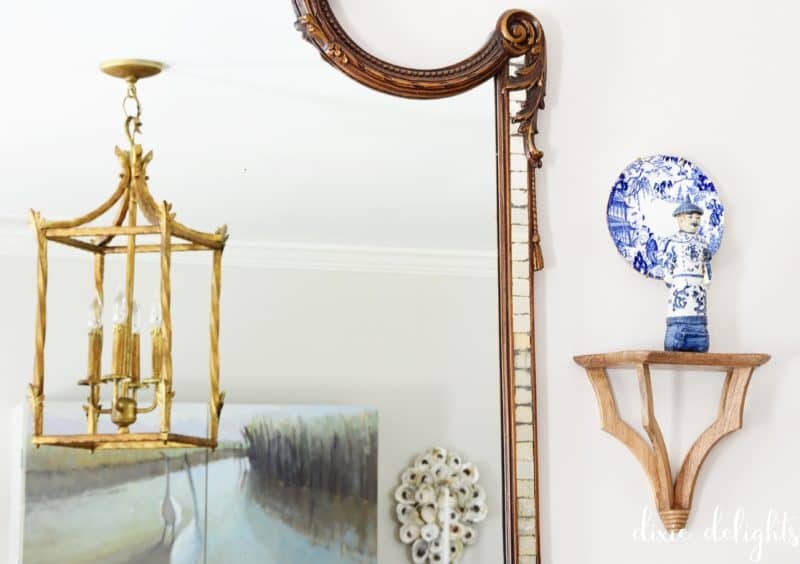 This antique mirror, purchased a couple of years ago in Savannah was the impetus for the latest change. It was too tall to fit over the original bed. Speaking of the original bed, it was really too large for the room as well, since it was purchased for our old house in a much bigger room with two more feet on the ceiling height. So, the mirror stayed, we sold the bed, and everything started to fall into place. 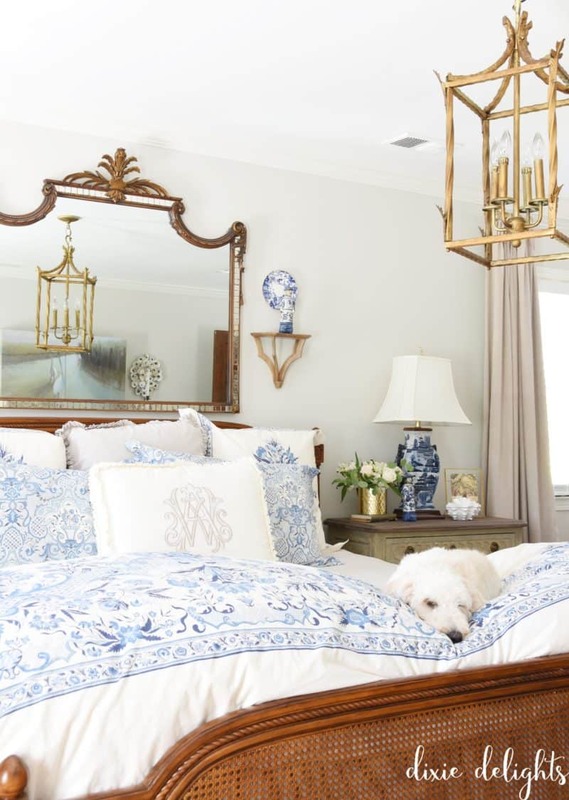 This is the Louis bed from Ballard Designs. 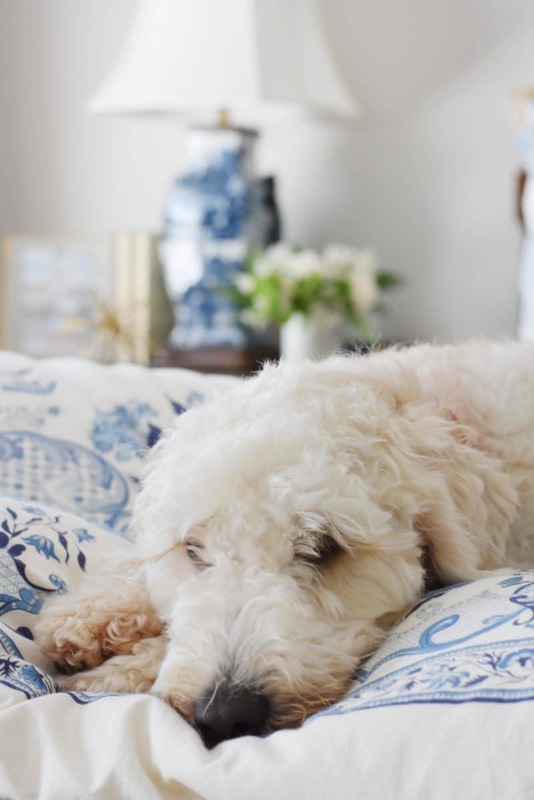 The blue and white bedding was a huge dual-income-no-kids splurge ten years ago from Yves Delorme. It is luxurious and still in pristine condition so I’m SO glad I got it when I did. I have no idea what the pattern is. 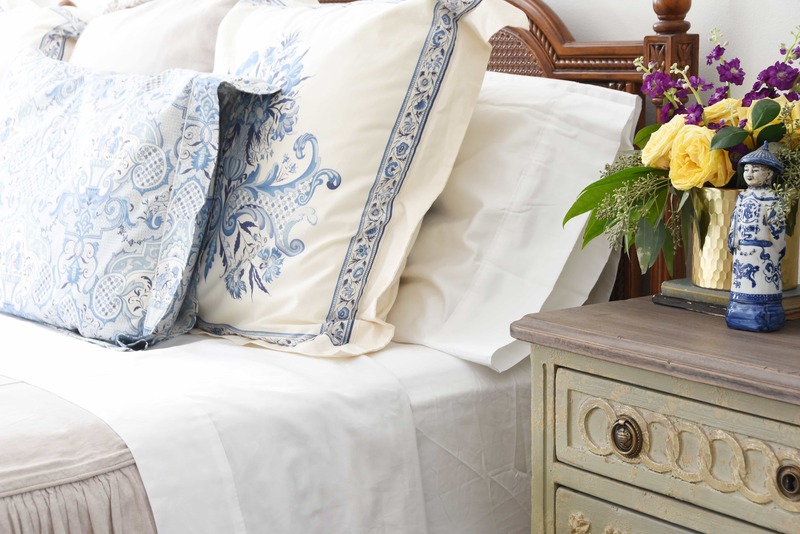 The linen box shams and waterfall spread are were called Legacy Essex from Horchow. 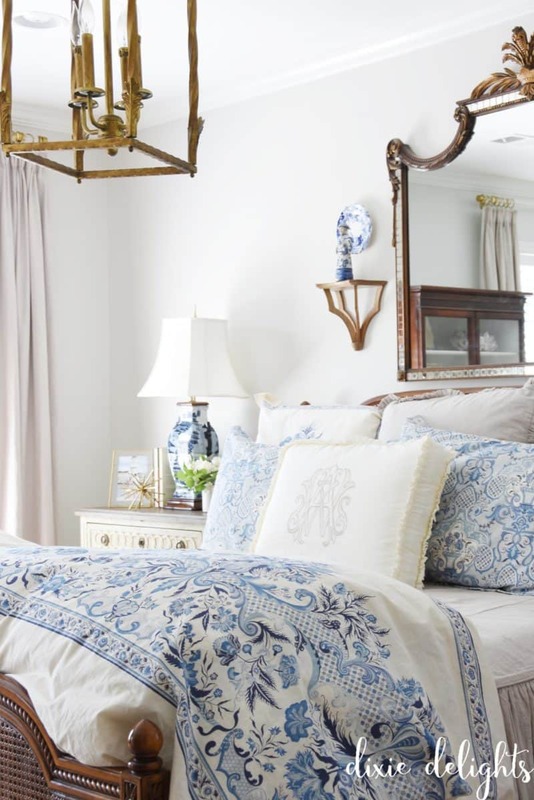 They have since been discontinued, but they do have a similar spread now (Pine Cone Hill Savannah Bedding.) They have worn well and wash well but if you are super picky you will probably want to press the spread after washing. Sometimes I do…usually I don’t. The two frames hanging in the corner over the chair were custom Sugarboo Designs (local to Atlanta) frames that once lived in my den, but found a new home here in the master when Honey gave me the Bellamy painting I’d been coveting for years on our tenth anniversary. They technically belong to the littles, as they were two of their “forever gifts” from years back. Believe me when I say that they aren’t the least bit upset that I’ve usurped them for our bedroom. 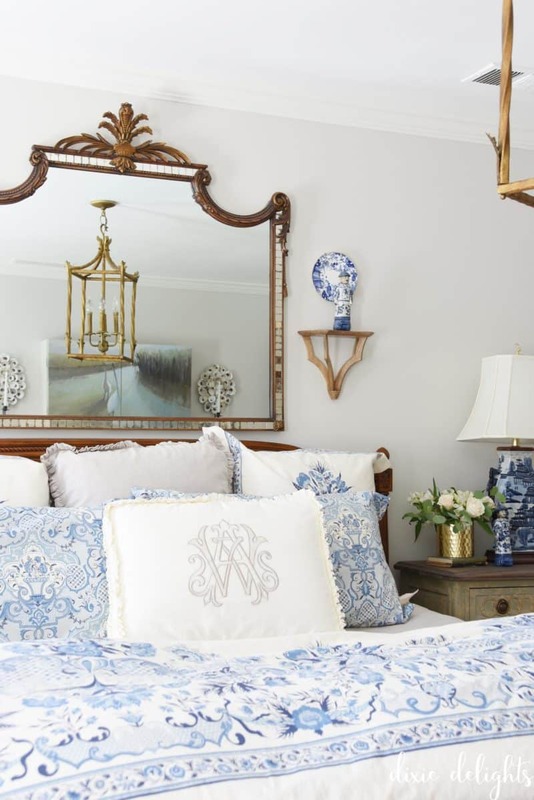 I had Number Four Eleven monogram the cream sham in my custom monogram. They always, always, always do splendid work. The sheets are by Perfect Linens and are the most amazing I’ve ever had!! The set with the scallop border is called Eternally Drapeful and the solid white are Baby’s Bottom. I have this thing about always sleeping on the right side of the bed. Ha! 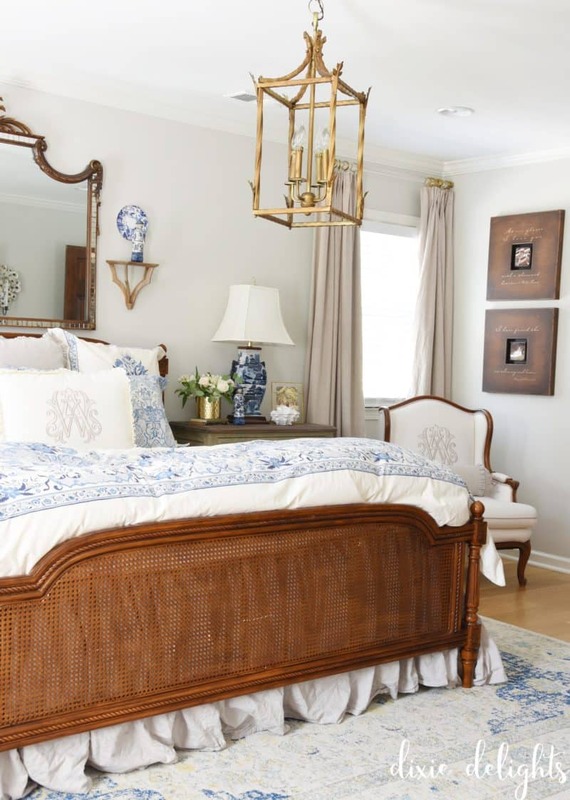 I’m glad it worked out in this bedroom because that makes my side closer to the door, and I am immensely more tidy that Honey :-) Therefore, his usual tangle of cords and devices is really not visible over the bed and pillows unless you walk straight across the room. 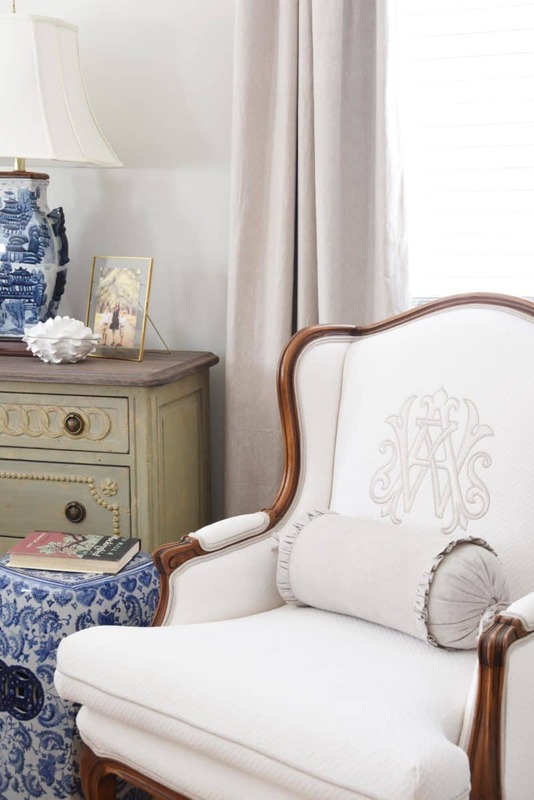 The monogrammed chair is one of my favorite Cinderella stories ever in the history of ever. I found the chair in a junk store and had my upholsterer work some serious fairy godfather magic on it. He removed the channeled back, upgraded the welting AND was able to work with a piece of fabric I had monogrammed at Number Four Eleven. 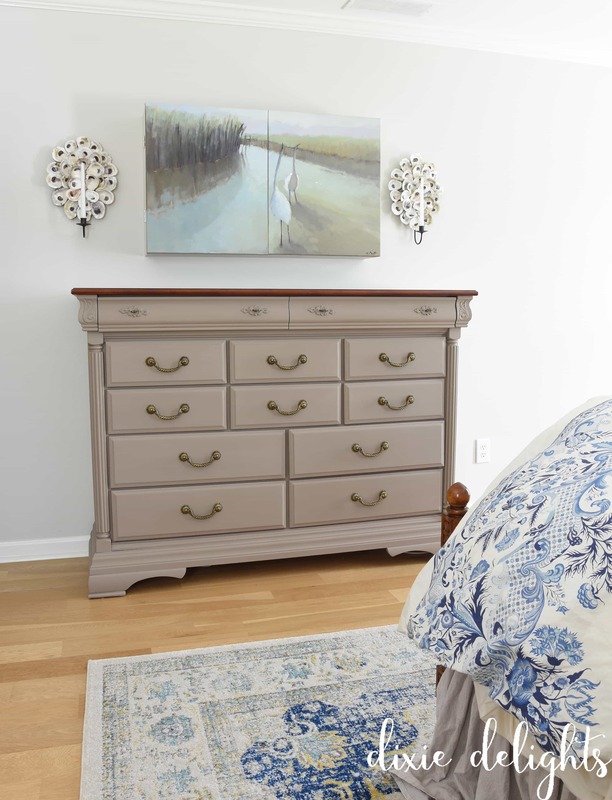 (See all of the before and after details here.) 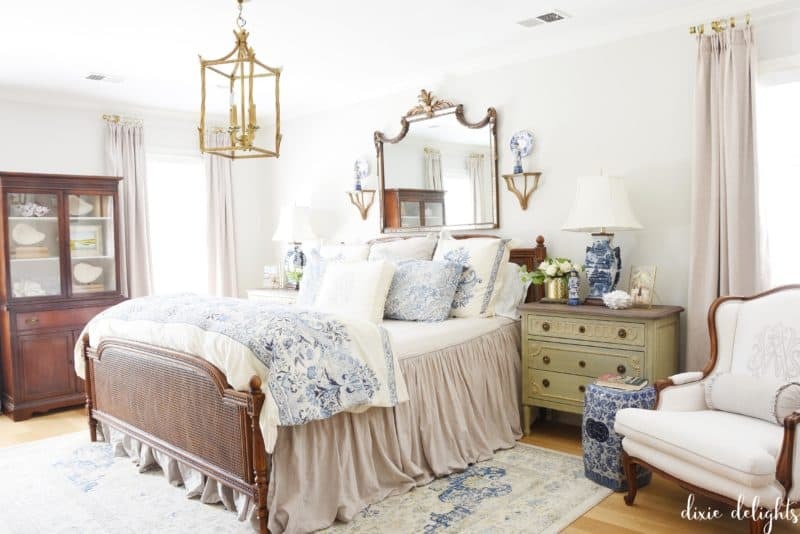 The body fabric is Tonga Snow Matelasse by Waverly and the double welting is done in extra yardage ordered from Horchow to match the bedding and drapes. The bolster pillow is from the same collection. 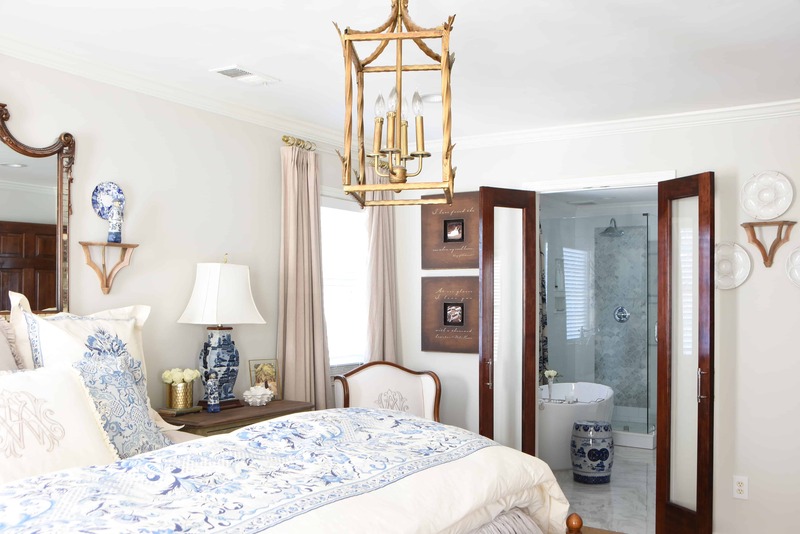 Here you can see how the bedroom opens on to the master bathroom. 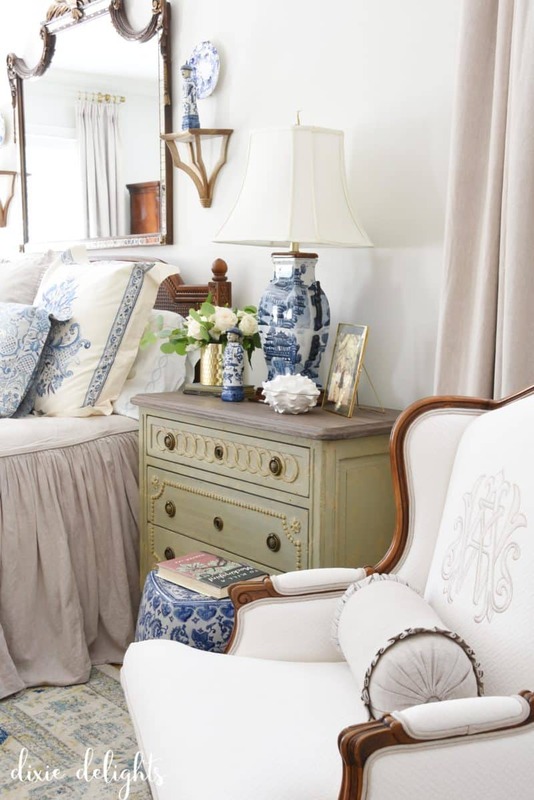 I had my eye on the bedside tables for eons so when I had the chance to work with Soft Surroundings last year, I jumped! 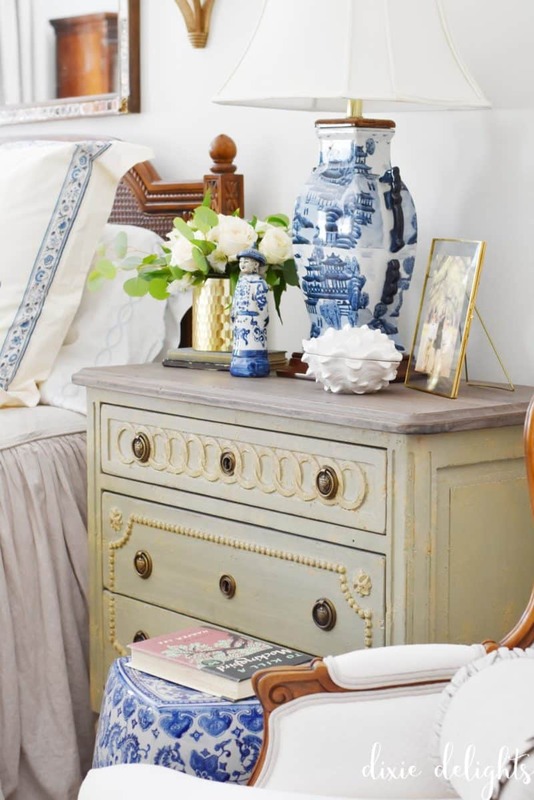 I’ve never had a bedside table with drawers and it is life changing. I love how much space I have on top to display pretty things and then how much space I have under to store all the not-so-pretty things. The drawers are even big enough to store the DVD player we sometimes hook up to the TV in here but don’t always need out on top of the dresser. I had the lamp in my attic for the last eight years and was able to sweet talk Sister into giving me her matching lamp for the other side of the bed. We bought them together at Bombay Co at least 20 years ago. Anyone remember that store?! 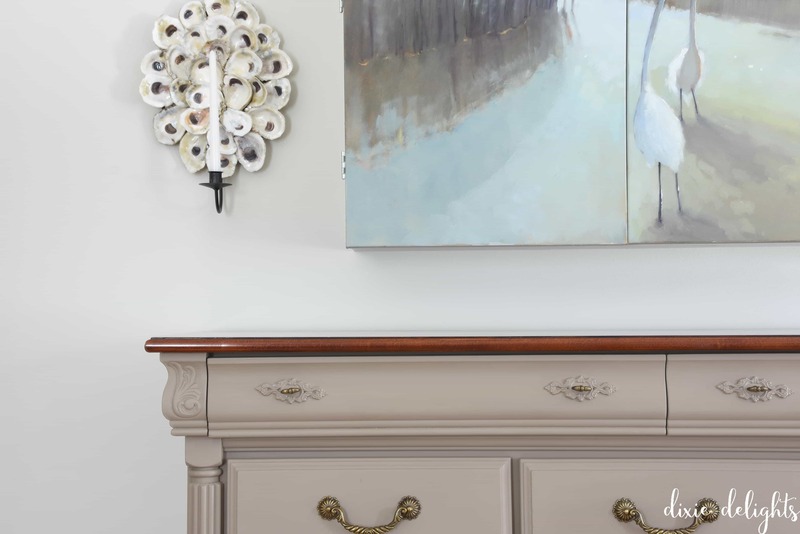 I added vintage dolphin finials, but you can find identical ones here: Oriental Dolphin Finial. The vase was a candle holder from Target and the picture frame is also from Target. Mother gave me the three blue and white china men from a trip to China years ago. I love them so, so, so much! 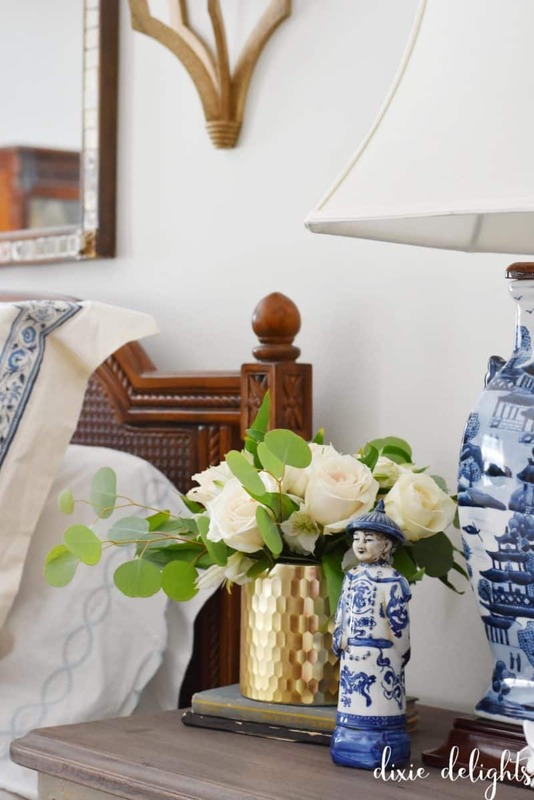 I love keeping fresh flowers on my bedside. I have a very specific and easy way that I arrange flowers and shared all the details in THIS VIDEO! 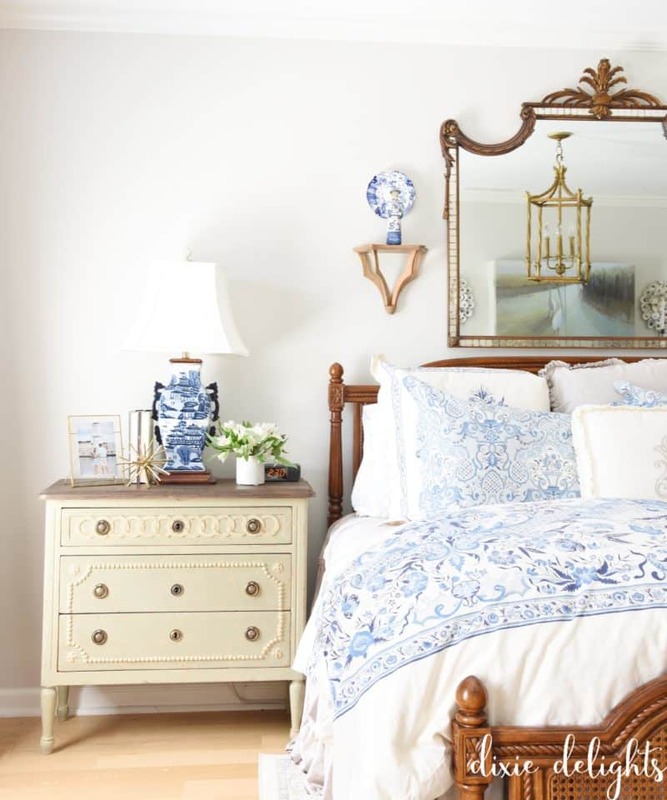 Over on the other side you can see that Honey has a matching table, lamp and picture frame. His vase is actually a bathroom container from Target. I thought about hiding the clock for a prettier pic, but I also try to convey real life here. (Although this particular post is a stretch on real life seeing as my bedroom is consistently the messiest room in the house day in and day out.) 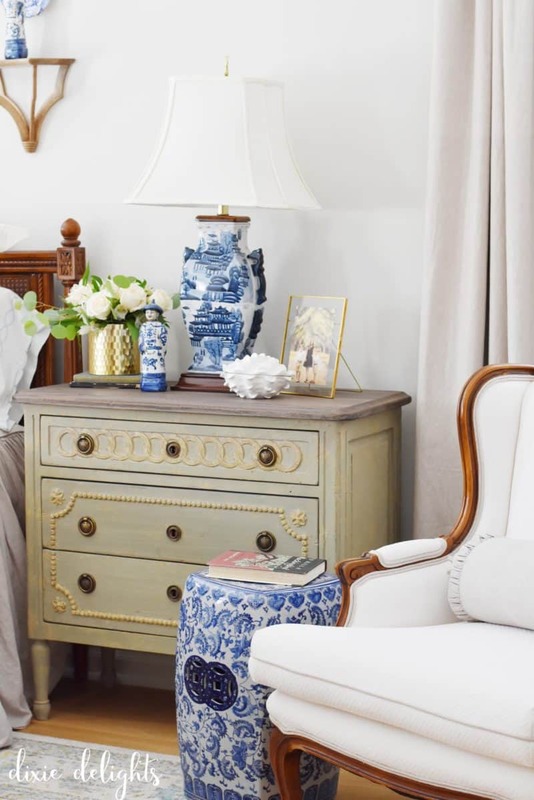 Looking around on Instagram and Pinterest you’ll be hard pressed to find a bedside table with a clock in the pic. 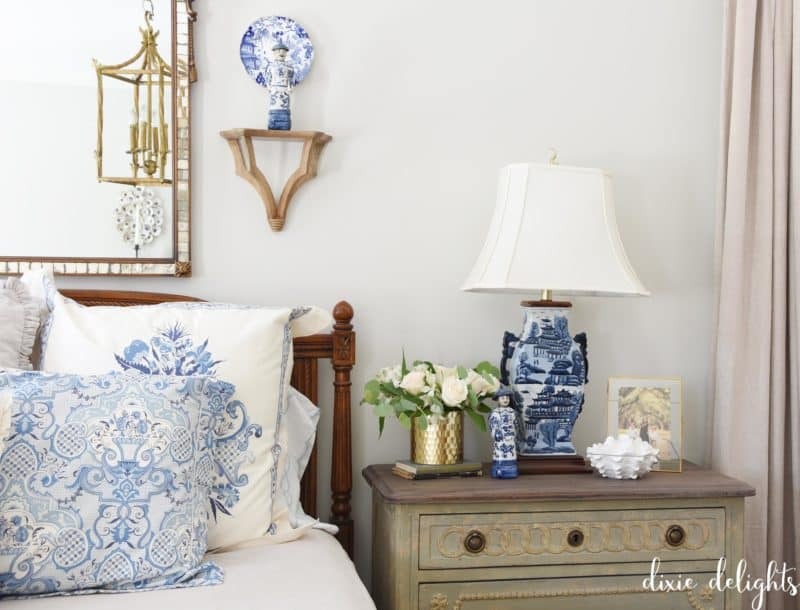 The sconces on either side of the mirror were from Ballard Designs. I had them hanging in a different space and moved them here when Honey kept bumping his head on them. The plates on either side were found on ebay for a song. They are called Blue Mikado by Royal Crown Derby. 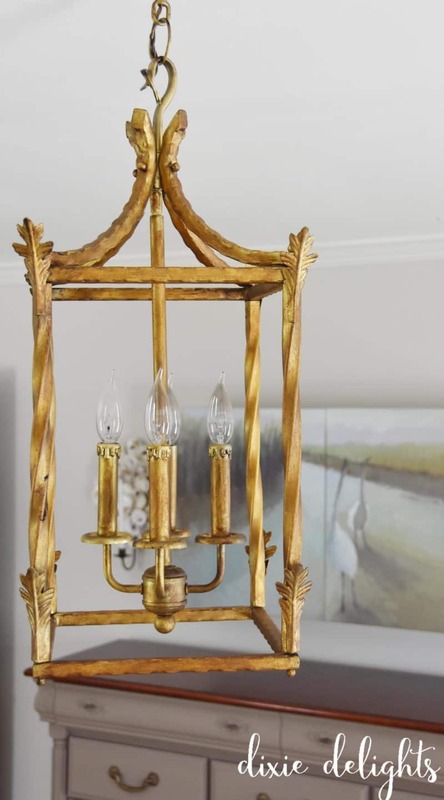 The chandelier was originally a brushed silver and was purchased on ebay when we moved in for about $50 including shipping if I remember correctly. I gave it a gold makeover as an EASY DIY project. You can find all of the details in THIS POST. One of my favorite updates was swapping out the old brushed silver rods for these acrylic beauties by Ballard Designs. When Honey installed the new rods he moved them up just under the crown molding. Between that and the clear rod, it really improved the look of the ceiling height! 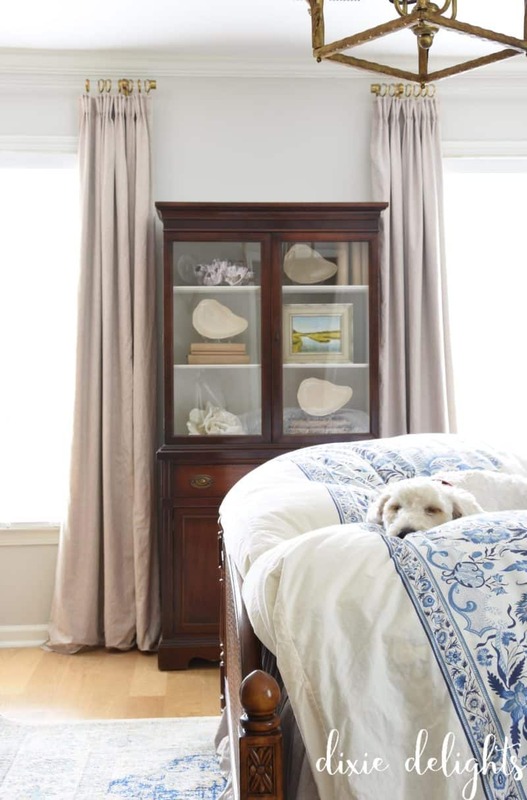 I made the drapes out of the by-the-yard fabric from Horchow that matches the bedding. It had a strange “warp” (according to Mother) and was terribly hard to sew with. I would NOT recommend it. 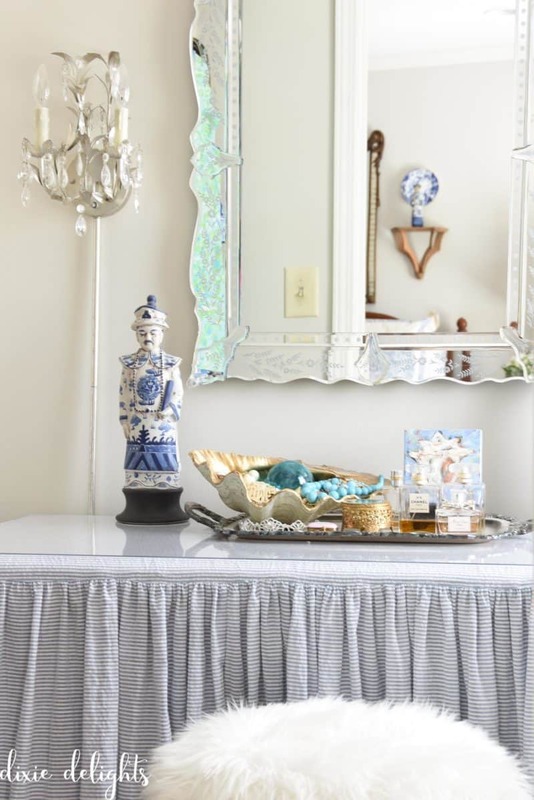 After a three year hunt for the perfect piece to sit between the windows in our bedroom, Honey got me this gorg antique china cabinet for my birthday a few years ago. Honey painted the inside in the wall color to brighten it up. 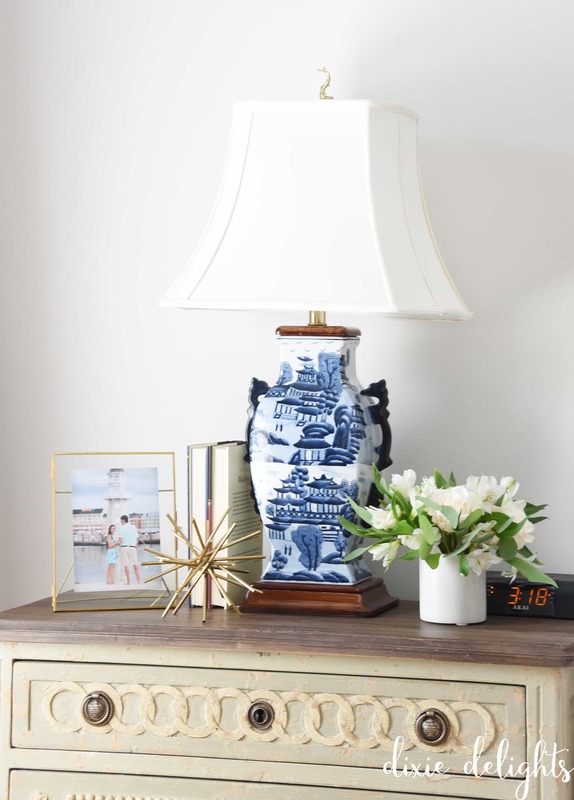 I stocked it with a barnacle from Home Goods, a wavy coral from Pottery Barn, a marsh painting by local artist Adam Houston, stacks of books covered in kraft paper (Dollar Tree) and a few stunning oyster plates in porcelain white from Alison Evans. See all the details here. I started out with a braided jute rug in here that was a mess from the time I brought it home. 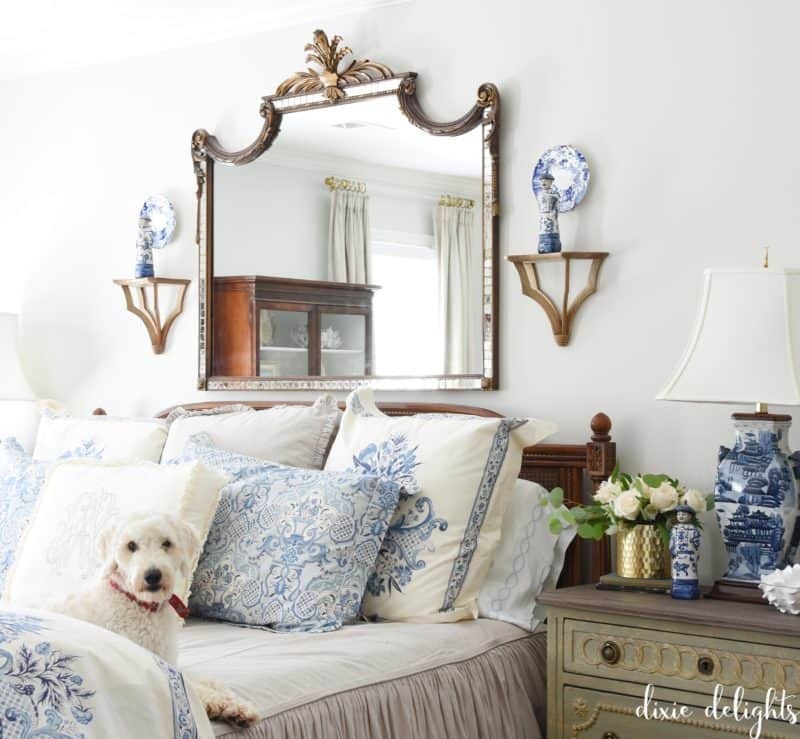 When it finally just unraveled, I really wanted to embrace the blues and whites in the bedding. With that in mind I landed on this beaut from Decor Market. The muted colors and wonderful patina make it look like its been around for ages. 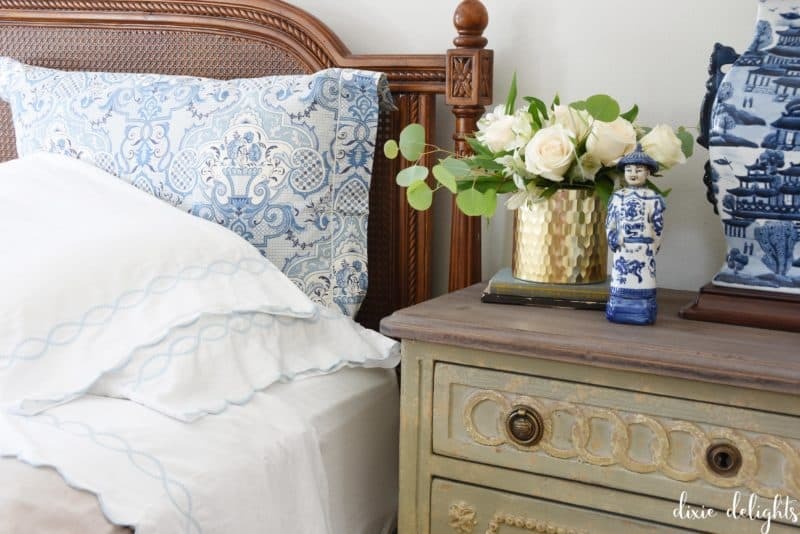 I also love that it ties together the colors from the rest of the house (sands and sea blues) with the blue from the bedding. 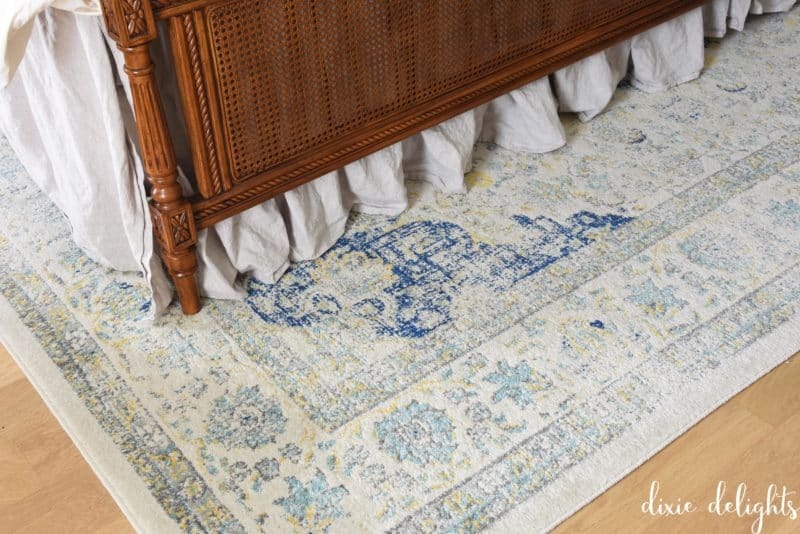 As far as rugs go, this one was a steal at $320 for 8×10 with free shipping. Looking towards the final wall in the room, you can see we have our mammoth dresser taking up all of the space. This was one of the first pieces we purchased after the wedding and it has served us well. It was originally unpainted, but really made this side of the room look so dark and heavy that I finally bit the bullet and gave it a coat of paint! You can read all about it HERE. After debating doing this for years, I am so glad we finally did! I left the top unfinished since we use the dresser daily and usually have stuff sitting on it. I figured it would wear better. 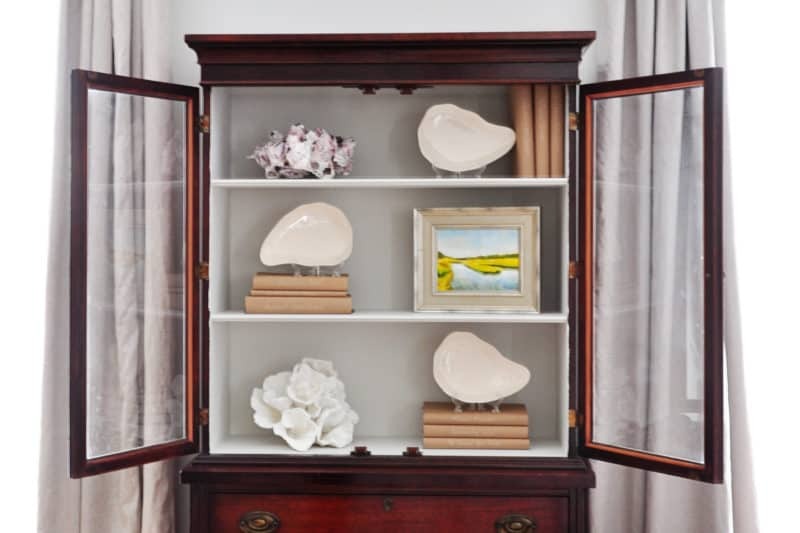 The gorgeous diptych oil paintings are by family friend and local artist Mary Pratt. They are everything I ever dreamed of in the way of art for this space. She is incredibly talented and a lovely lady to boot. And would you have guessed that a flat screen TV is hiding behind all of that gorgeousness?!?!? Honey built this custom cabinet and blogged about all the details here. 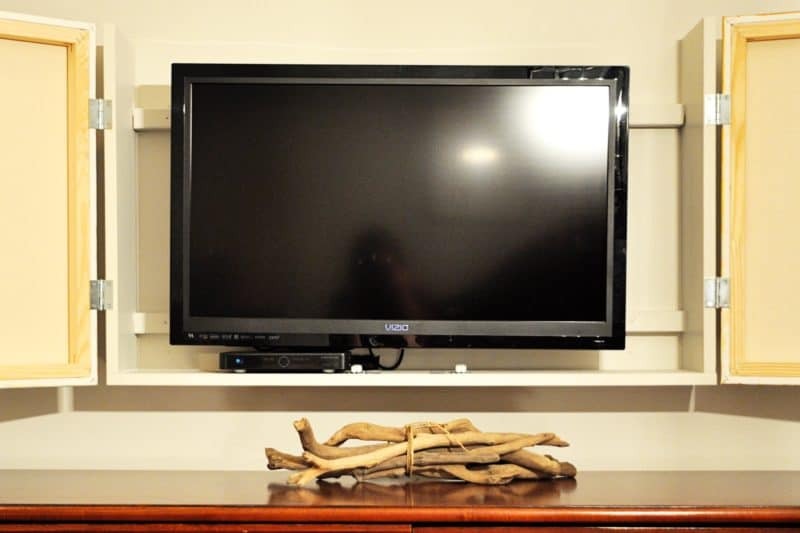 It opens to reveal our TV and little cable box. 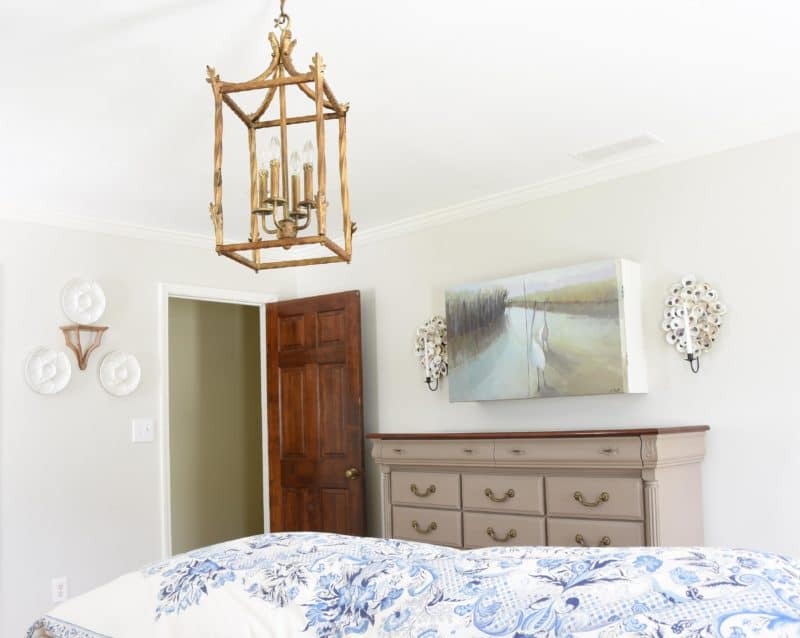 The pair of gorgeous oyster shell sconces are from Tery at Lure Coastal Designs. She does really beautiful work with oysters and is a lovely person as well. And, finally, you can see how the bedroom and bathroom flow together. 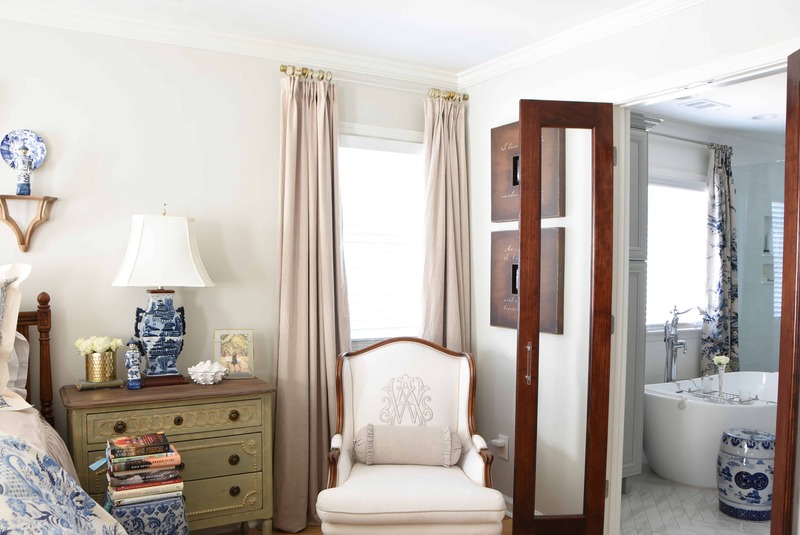 A detailed reveal of the bathroom and all of the sources are found in THIS POST. Have a wonderful week! On the decorating front I am starting to put out some spring and Easter touches. It looks so pretty Amanda! I adore your new bathroom! Thanks for sharing this space! I loved touring your bedroom! 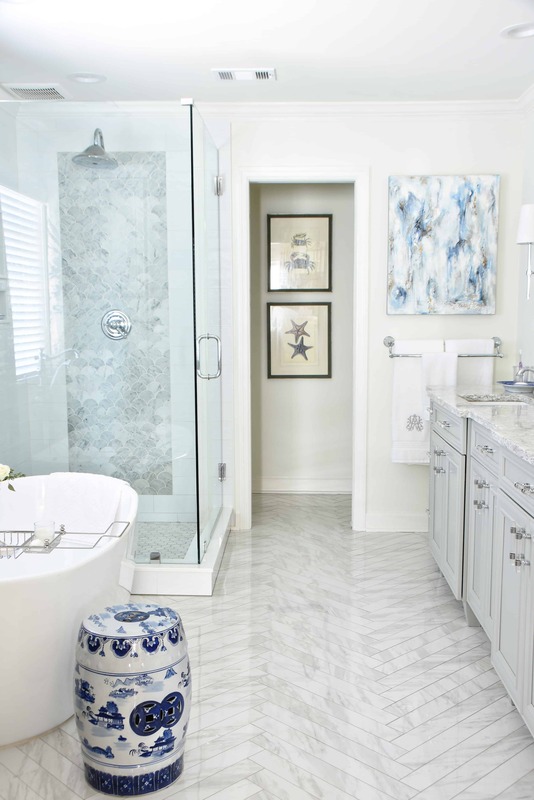 I remember some of those previous projects and it’s nice to see it all in one post…along with your gorgeous bathroom! I also sleep on the right side which is closer to the door…and my husband’s side is very “practical” as well! Enjoy the rest of your week! Thanks Shelley! Same to you!